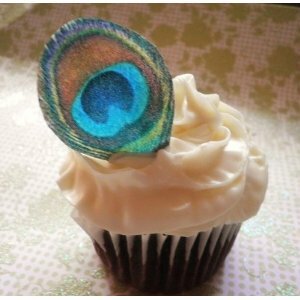 These lifelike Peacock feathers are completely edible! Each order includes 12 peacock feathers as pictured. Measures 2.25 inches. All items require 3 business days (Mon-Fri) BEFORE shipping as they are made to order – please pay close attention to your order confirmation expected ship (date they are sent for shipping) and expected delivery (date you can expect to receive them)*** Use regular frosting or corn syrup to adhere to most food items, wine glasses, or serving dishes. Made of wafer paper (potato starch, vegetable oil, water) and food color. FDA approved print. Each butterfly is handmade to order and has been brushed with a coat of vanilla. Pre-cut and ready to use on all your baked goods. Use within 4 months of receiving them. Store in the vacuum sealed packaging they arrive in. Each item is sealed for optimum freshness. Do not refrigerate.